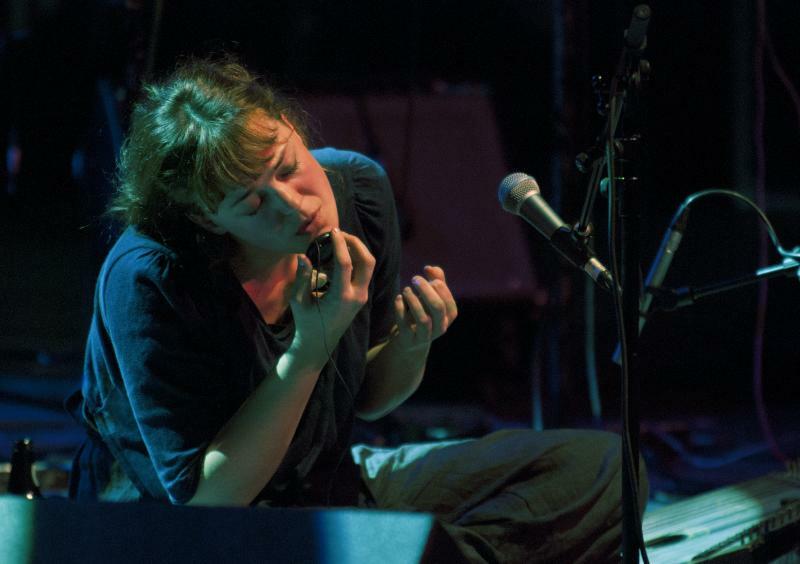 Mari Kvien Brunvoll’s music is a personal expression that straddles jazz, electro pop, acoustic blues and folk music from different corners of the world. The Norwegian musician has been touring extensively as a solo artist since 2008. Her self-titled album (2012) was nominated for the Norwegian Grammy in the open category. The track, “Everywhere You Go”, from this album, earned her a new audience when Ricardo Villalobos discovered the song and created a 28 minute long remix of it. Mari has also been touring and recording with several other projects, duos and trios, on top of working with dancers, authors, and actors. Can you talk about your background – how and where did you start with music? Do you recollect your first musical memory? My musical memories from the early childhood are muddled; that is to say, I have no idea what came first. But I do remember waiting for my mum in the kitchen while listening to her giving piano lessons to her students in the next room. And I used to record specific radio shows on cassette, and I would note down the name of each fascinating musical piece I heard. I realised I wanted to make music quite early, and studied it at high school from the age of 16. After that I studied Jazz at the Conservatory of Bergen, and spent some time in India and Berlin in between. I realised that Norway is a small country, but that music is universal; you can go anywhere and meet people with similar interests throughout the world. You come from an artistic family – can you talk about growing up and what role art & music played in your upbringing? My mum was a musical teacher, singer, and pianist. She still is, and she also writes poems. I believe that experiencing her open attitude towards the arts has influenced me. I was fortunate to be able to check out experimental music with my mum every summer, during the Molde Jazz Festival. I liked the way new sounds influenced me; making me feel high and light somehow, and open inside. As a child I used to borrow Roxette cassettes from my much older sister and brother, and when it was dark I would dance and secretly watch my reflection in the window. Having older siblings who were very into music was a super way of being introduced to new artists. What role does voice play in your music, and do you have any vocal inspirations? The voice is my soul, my channel, or something like that, and my main method of artistic expression. At times when I can’t express myself through singing, either due to some issue with my voice or simply a lack of inspiration or belief in myself, I find it really hard to work with music. But I really enjoy playing other instruments as well. I have just bought my first piano, after not having played the piano for years, and I am like a child now. The piano suddenly sounds so fresh and rich to me. I like to work with both acappella voice and with heavily manipulated voices using effects, amps, and samplers, and I enjoy the surprise of the meetings of voice and slightly off-pitched voice-like instruments like flutes, kalimbas, organs, and also analogue synths with animal-like sounds. There are many voices that have been important to me in the process of trying to find my own voice. I often listened to Billie Holiday and other jazz singers in my youth, and also guys like Marc Bolan and Neil Young. These days I find it more interesting to listen to instrumental music or electronic music, and sometimes I intuitively try to catch where the element of voice could have fit into that music. I have fallen in love many times with voices from Indian or African traditional music and also old blues musicians like Memphis Minnie and Skip James. I like it when voices have some kind of deep ugliness and beauty at the same time, and also a feminine and masculine sound. I think I’m drawn towards voices that inhabit some kind of duality of expression. Can you talk about how you make your music? I’m always looking for new methods of making music, and I’m happiest when I get the chance to work intuitively and playfully. For instance, I often like making music on instruments or equipment that is unfamiliar, because it activates the intuition. When I was making music for films last year it provided me with new ways of thinking, and suddenly I made a different form of music, quite new to me. I improvise a lot in my studio, and I often record what I do in order to refine the sound or enhance the melodic or rhythmic qualities that come out of the session. To me, making music is to look for something. To sing, seek, and listen, simultaneously. As I open my mouth to make sound, it’s like a water drop forming and falling to the ground: Splash. And then it’s gone, just like the sound is gone. And just like water falls differently each time depending on so many factors, the voice is dependent on air, power, body movements. I often must remind myself that to be able to work with music I must accept finding myself in between the beginning and the end result. I dream of being able to rest or float or whatever, in the space where creation is happening. And I have the belief that this is possible to some extent. But either I work too hard or I fall apart in dealing with all the contradictory feelings that arise in the process. Remaining focused and steadily working is a tiring process. Additionally for me, making music involves many emotions; pleasant and dark emotions meet, and the strength of the feelings is just so intense. I truly love to create. I am activated by looking for what is lacking in the musical soundscape or mood: “Is it too light, is it too dark? This is thick, now I need thin!” It’s like something could tip over the edge. For me, trying to balance it has a lot to do with artistic presence. Your album was nominated for the Norwegian Grammy. What were your feelings about it? I was very happy to be nominated. It was encouraging that they had discovered my music, despite very little promotion. This solo album is made out of live recordings, and it was really cool to get such recognition for my solo project, especially since I have never worked so hard on anything in my whole life. I had already been playing a lot of live acts before releasing anything, and it was so interesting to see that the live recordings could work well without being couples with the visual experience of a concert. Minimal techno producer Ricardo Villalobos remixed a track off your album. What did you think about it and have you been inspired by electronic music? It is really incredible how he made such a long meditative piece (30 min) out of this song. I find his work mesmerizing, and I’m deeply honoured by his interest in my music. I have definitely been inspired by electronic music as a genre. I would even say that electronic music is what I listen to most in my daily life. For instance Four Tet, Alog, and earlier composers like Stockhausen. I enjoy working with my colleague Espen Sommer Eide (Phonophani, Alog) who makes wonderful electronic music. We have a duo together called Kvien & Sommer, and we have released a record titled Weathering on the Russian label, Full Of Nothing. The lyrics in Everywhere You Go are also poignant. Can you talk about them? This kind of question is hard to answer, because I want the listener to combine his or her own personal experiences with the words! In Everywhere You Go I have borrowed the lines from a Memphis Minnie song (she inspired me greatly earlier on) and mixed them with my own lyrics. The lyrics express a mix of feelings, a state of mind, or some kind of situation in your life that could make you realise that “this is it, this is my now”… The lyrics are quite open, the strange man they describe may be some kind of devil, or a negative memory. At the moment I’m composing and recording music in my studio for a theatre piece, a version of the folk tale, Cinderella, at the National Theatre Scene in Bergen. It is challenging in many (good) ways. I have not written melodies for singers other than myself before, and now I’m composing the whole soundscape. I’m also in the process of building hanging porcelain instruments, inspired by the glass instruments of Harry Partch. My trio project, Building Instrument, will record our third studio album after the New Year. Other than that, I have plans for several collaborations, and I will also play some solo events in the coming year.